A lovely review from Amber of ABCs to ACTs. If you’re a regular reader, you know how much we love books around here. Picture books, story books, pop-ups, it doesn’t matter! I am a huge fan of the classic children’s books and love reading them to Nicholas and Skylar when I get the chance but we love finding new books as well. Books that are new to all of us. 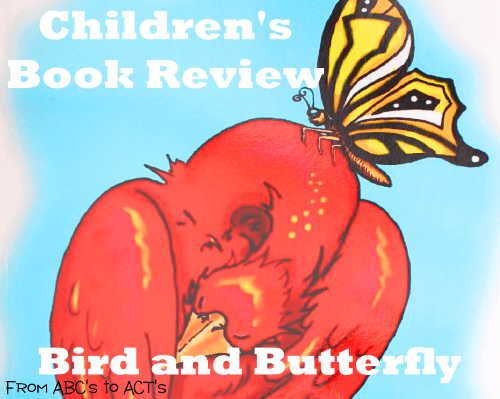 So when I was contacted a few weeks ago by the lovely Amanda Stanford to see if we would like to review her new children’s book Bird and Butterfly, I couldn’t resist! Just looking at the cover gives you a sneak peek at just how gorgeous the images are! The story revolves, of course, around Bird and Butterfly and their trek around the world. The chase is on and Bird chases Butterfly through forests, past volcanoes, and through the desert and the images throughout the book are absolutely beautiful! Illustrated by the incredibly talented Dutch illustrator Kitty Van Oosten, Bird and Butterfly is full of bright, colorful, and vibrant images that capture your child’s attention and engage their imaginations. Not only are the pictures amazing, but the book was designed specifically with early readers in mind! The story’s text and pictures are completely separate with the text appearing first, encouraging little readers to focus on the words of the story before they ever reach the corresponding image. And big, bold text helps even the littlest of readers focus. Nicholas absolutely loved this book! While he obviously doesn’t know how to read yet, it has been a lot of fun to watch him point at the words and “read” them to himself even if we can’t quite understand what he’s saying lol. And, although I have tried (many, many times), photographic evidence of his love for this book just isn’t happening as we are apparently going through a “no pictures” phase in which he says “no” and runs away laughing whenever the camera comes out. I’ll continue trying but in the meantime, please take my word for it, this book is amazing! It is not only perfect for even the littlest of readers in your life, but the illustrations are so incredibly beautiful that you’ll forget you’re even reading a children’s book! -Thanks to Lazy Hippie Mama for this amazing review! I was contacted by Dr. Amanda Stanford who asked if I would be willing to review a new book for very young children that was written in a different way. I was intrigued and agreed. The book, Bird And Butterfly, came and I flipped through it and knew right away that I wanted to share it with Toddler-saurus Rex to see how he reacted. The main difference in the book is that all of the text is kept entirely separate from the illustrations allowing children to focus, individually on each aspect. After you read this statement and get the idea in your mind, you have the treat of turning the page to see the stunning illustrations by Kitty Van Oosten. I LOVED that these pictures weren’t “cartoonish.” They were gorgeous, artistic creations that T-Rex and I would both really look at for a long moment before turning the page. Often he would comment, “there he goes!” or “He’s chasing him!” Which let me know that he was making the connection between the words I had read to him and the picture we were looking at. These books have been endorsed by Dr. Robert Titzer, creator of Your Baby Can Read and I can see why. They truly show, in a more obvious way than traditional children’s books, the connections between the words and the story. -Thanks to Krista Guerrero of Monkisee.com for this amazing review! I just found out about this delightful new book series that encourages early readers to read. Bird and Butterfly by Amanda Stanford has bold, beautiful illustrations that children will love. The simple story keeps the text and the illustrations separate. This is brilliant as it naturally draws a child’s attention to the words on the page, encouraging young children to read the story themselves without being distracted by the pictures. These books are exactly what I spent days creating for my kids when we were teaching them to read as babies and toddlers. It is so nice to be able to purchase quality products to encourage early readers without having to create everything yourself. Amanda Stanford has several more books in the works which look really nice. -A wonderful endorsement from J. Richard Gentry, PhD, author of Raising Confident Readers: How to Teach Your Child to Read and Write—From Baby to Age 7. Snap, flutter, snap, flutter! Bird and butterfly swoop, dive, tumble and roll across deserts, atolls, mountains and ocean reefs. Any child will delight in this boldly written and beautifully illustrated story of the chase. Is butterfly in danger or are best buddies having fun? Baby/toddlers will want to share this engaging adventure story with you over and over. This is a great boy book but girls will love it too—and it’s perfectly scripted to teach baby/toddlers to read! -A lovely endorsement from the creator of Your Baby Can Read, Dr. Robert Titzer. This is Dr. Titzer. I found a fantastic children’s storybook that is designed to teach reading. I think many of you will love it! Since it is difficult to find storybooks that do such a great job of separating the text from the illustrations, I want to share it with you. Infant Learning is no way receiving profits from the sales of the book. I am recommending it because I think it will help many of you as your child moves through the Early Literacy Milestones toward independent reading. It is an ideal book for teaching reading and for babies and toddlers who are early readers. Bird and Butterfly, by Dr. Amanda Stanford and Kitty Van Oosten, is beautifully illustrated as well. Please continue entering photos in our photo contest. We want to feature actual users of YBCR in photos on our new Early Learning Website to be launched this month!